Description: Black 2" long straight connector beam (measures 2" long, 1/2" wide, 1/2" deep). Description: Black short straight connector beam (measures 1/2" long, 1/2" wide, 1/2" deep). 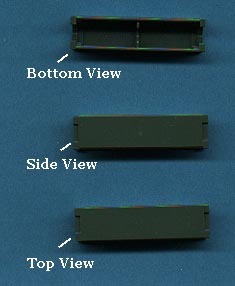 Description: Short black connector beams with 2 pegs on the sides (measures 3/4" long, 1/2" tall, 7/8" wide). Description: Green (military green) 2" long straight connector beams (measures 2" long, 1/2" wide, 1/2" deep). 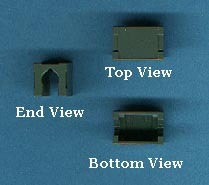 Description: Green (military green) short straight connector beams (measures 1/2" long, 1/2" wide, 1/2" deep). 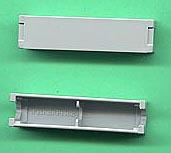 Description: Grey 2" long straight connector beams (measures 2" long, 1/2" wide, 1/2" deep). Description: Grey short straight connector beams (measures 1/2" long, 1/2" wide, 1/2" deep). Description: Orange 2" long straight connector beam (measures 2" long, 1/2" wide, 1/2" deep). Description: Orange short straight connector beam (measures 1/2" long, 1/2" wide, 1/2" deep). 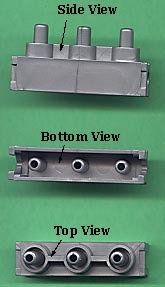 Description: Silver 2" long connector beam/electronic bus with 3 female receivers (1 on each square open end, and one on the bottom of the beam), and 1 male receiver on top of the beam. Measures 2" long, 1/2" wide, 1/2" deep. Description: Silver 2" long straight connector beam with 3 round raised pegs on the top, and 3 round pegs on the bottom (measures 2" long, 1/2" wide, 7/8" tall). Description: White 2" long straight connector beams (measures 2" long, 1/2" wide, 1/2" deep). Some beams may have a paper litho on the side...either dark blue, white, and light blue striped, or black with white "alien" writing. Description: White short straight connector beams (measures 1/2" long, 1/2" wide, 1/2" deep).